The number of cars used in the U.K. is steadily increasing, and many families now own more than one car. In 2009 for instance, the ownership of cars rose by 30%, while the population increased only by 4%. And this trend will probably continue; on one hand, many new cars are purchased and licensed in Britain every year, and older cars are also more frequent on the roads – as cars become more resistant. What does this mean for car park planners? 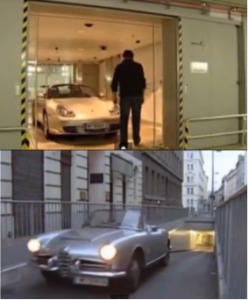 They have to develop new technologies, as parking space will become scarcer and scarcer. Especially inside large towns, which were built without the planners having imagined that one day millions of vehicles would cross their roads – and look for a free space to park. Even where large car parks are still available, and sufficient for today’s requirements, techniques to increase parking space will soon have to be considered. At busy airports for instance, where many travellers like to park their car as close to the terminal as possible, an extension of the available parking will soon become necessary. Also, the wider spaces around airports – that are taken by car parks today – may be coveted by large hotel chains, companies, malls, banks and convention centres that will need additional car parks for their own purpose as well. So how will the need for more parking spaces be satisfied? 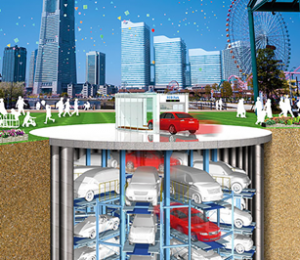 In fact, the technology to increase parking space – simultaneously saving surface space – is already in the making, and has been implemented in several towns. Several companies, like A.P.T., already installed fully automated parking. The principle is simple: you drive up to the garage – whether constructed over the ground or underground – and leave your car on a special surface, as instructed by laser sensors that guide you exactly to the centre of the platform. You close the engine, and leave your car. The car plate is automatically scanned, and a picture of your car is taken. The system also makes sure nobody is left inside the car. After you left the platform, you confirm pressing a button. The platform – also called “pallet” – than starts shifting sideward, upwards or downwards – depending on the closest free space the computer system has attributed to it. A “shuttle” – a flat vehicle loading the pallet with your car – drives it than to the assigned space, which can be on any of the many floors of the parking garage – as the storeys are only half the height of a usual building floor. During all this procedure, your car is moved smoothly and gently by the robot system – and no human hand ever touches it. Astounding, isn’t it? Of course, the garage is not completely emptied of human life – at least one technician is always present to fix any problem that may occur to the automated system, and specialists familiar with the system oversee its excellent functioning from their control room. But you will hardly ever see any of them. When you come back to collect your car, a device scans your ticket, and the computer system calls up the “shuttle” with your car on its pallet, ready to be brought to you – also fully automatically. The pallet with your car is shifted on place, so you can just enter it and drive away – and the whole process doesn’t exceed two to three minutes. 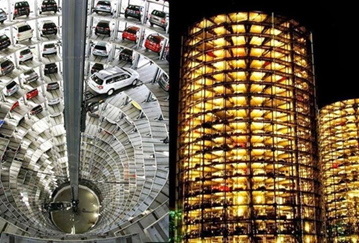 Such systems are operational mainly in Germany, built under a famous ancient hotel in Austria, decongesting Copenhagen in Denmark, and a garage able to hold 1100 cars is planned in Dubai. Similar systems – but built as round towers or underground pits – are also planned and operational in Japan. 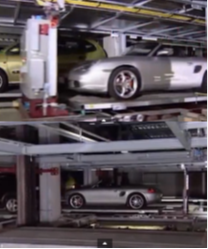 The system consists of a palleted elevator hold and moved around a huge central iron pole – that shifts the cars into free slots around it on several floors. Such fully automated systems have also been built to store bicycles – which are deposited on the elevator with its gripping mechanism at the entrance and than “parked” into the pit. Not only do these automated garages liberate precious space in places where many people convene – they also offer the possibility to cover them with ecology-friendly parks, walkways, shopping centres etc. doubling their utility. found around London, and also next to the terminals of the busiest London airports. But for the time being, we still have the privilege of being able to choose among a large variety of parking options at any of London’s airports, at prices varying according to the comfort of the offered service. If we opt for the “Meet and Greet” option, we also have the pleasure of meeting a smiling professional driver at the airport entrance who will park our car in a secured parking during our journey. This is certainly a friendlier way of delivering our car to a specialized car park than being just met by a robot saying “stop” and “go”. Who knows, maybe in future the automated robot parking will also offer a cup of coffee?